Superstar Will Smith gave the performance of his career and received his first Oscar nomination as boxing legend Muhammad Ali in this amazing epic drama from Oscar nominated director Michael Mann (Best Director, The Insider, 1999). $10.216 million on 2446 screens. Biopics can be very tough to pull off successfully, and they become toughest when they involve already-famous personalities. Geez, the makers of A Beautiful Mind ran into trouble for some liberties, and John Nash was not a terribly well known person. When filmmakers take on subjects like George Patton or Wolfgang Amadeus Mozart, the challenges escalate. However, at least we don’t know those folks well through vivid historical documents. The actors involved had a fair amount of leeway to make the personalities their own. When a movie takes on someone who became famous in the TV age, the challenges increase. The more famous the person, the more difficult success could be. So what do you do when you create a biography about one of the world’s most famous men? Pray, I suppose. In any case, that didn’t stop director Michael Mann from trying, as he attempted to tell us the story of Muhammad Ali in this 2001 epic. Actually, Mann didn’t try to cover all of Ali’s life. Just like Patton only covered the general’s World War II experiences, Ali sticks with a specific period of time, albeit one that lasted longer than WWII. Ali starts in early 1964 and covers a decade of the boxer’s life. It begins with his seminal bout against Sonny Liston and concludes with his rousing battle against George Foreman. In between the film focuses on a few specific topics. We watch the relationship between Cassius Clay (Will Smith) and black Muslim leaders like Malcolm X (Mario Van Peebles) and Elijah Muhammad (Albert Hall). The latter eventually redubs Clay as Muhammad Ali. The boxer becomes a huge star due to his flamboyant personality, but he takes some knocks via his involvement with the controversial Muslims. Matters become worse for Ali when the military drafts him and he refuses to go. Though he avoids jail time through a series of court appeals, but Ali loses scads of money because he can’t get permits to fight. Eventually he earns his freedom again, and he engages in a few different bouts; the movie climaxes with the 1974 “Rumble in the Jungle” against Foreman. I looked forward to Ali and expected to like it. However, I felt quite disappointed by the film. Although I’m too young to have experienced Ali’s early days, I clearly recall the huge fame the boxer enjoyed during my childhood. Heck, I even owned an Ali action figure when I was seven or so! Since the film covers a period before I became old enough to follow Ali, I was interested to get a better idea of what had happened. To be sure, I had a rudimentary understanding of Ali’s life, but I hoped the movie would flesh out those days. Unfortunately, my knowledge of the era remains pretty basic. In many ways, Ali feels like a “greatest hits” reel. It flits from topic to topic fairly quickly, and rarely offers any depth. Ali’s interactions with the Muslims during the mid-Sixties and his fight to stay out of jail toward the end of the decade make up most of the film, but they seem somewhat rushed. Granted, that may be inevitable for a movie with such a wide scope, but I think director Michael Mann could have followed his subject in a more substantial way. Ali often feels like it elevates style over substance. Mann offers his usual flash and panache, but those elements fall flat for the most part. Even the boxing sequences lack much impact, and a lot of the film honestly comes across like a wannabe. Toward the end, Ali runs through Zaire and people follow along with him. I couldn’t help but wonder when “Gonna Fly Now” would swell in my speakers. The movie also rarely seems like anything more than a puff piece that glorified Ali. I can’t say I expected it to be really down and dirty, but it glosses over his flaws and comes across too much like a hagiography. We see his adultery and some other issues, but we’re never given any indications of problems caused by these. Ali’s women come and go, and they make no impact whatsoever. However, with the exception of most of the female characters, the supporting cast of Ali does make the film seem more substantial. The flick packs a fine roster of talent, and most overcome the slim nature of their parts. Some get totally lost in the shuffle, though. For example, I knew LeVar Burton appeared in the film, but not until I watched the credits did I realize he portrayed Martin Luther King in a couple of “blink and you’ll miss him” scenes. Otherwise, some of them bring a lot to the table. Jon Voight earned a well-deserved Oscar nod for his warm and human take on Howard Cosell. This is a tough part; I suppose younger folks don’t recall Cosell well, but for many of us, he remains a vividly remembered presence. Voight had a lot to lose, but he manages to make the broadcaster seem real and three-dimensional. Never does his work come across like a Rich Little impression. Even buried under much makeup, Voight does nicely. 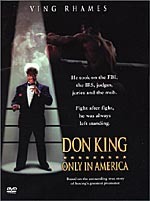 Mykelti Williamson imbues promoter Don King with all of the appropriate bluster, and Ron Silver miraculously brings substance to the nearly unwritten part of trainer Angelo Dundee. We learn of Ali’s closeness to his longtime partner. Of course, Mann never fleshes this out, but Silver’s presence almost makes us understand it without exposition. Jamie Foxx displays remarkably little ego as cornerman Drew “Bundini” Brown. Shown with balding head and paunchy gut, Foxx looks miles away from the aspiring hunk and hero of Bait. Brown’s another woefully underwritten part, but Foxx adds some life and zest to the role, and he really lets himself show the depths to which the character sinks. As I’ve perused other reviews of Ali, I’ve noticed many people who express that they usually don’t like Will Smith as an actor but they loved him here. My feelings run the other way: normally I like Smith a lot, but I didn’t care for his take on Ali. One of the most charismatic men of our time, Smith fails to bring much spark or life to the role. He seems oddly dazed and subdued much of the time; Smith’s own natural charisma is nowhere to be seen. I also found it tough to suspend my disbelief. I could buy Voight and Williamson as well-known personalities, but Smith couldn’t pull off the title role. He suffered the tougher challenge, since he was onscreen for virtually the whole film, but Smith simply never made me feel I was watching the Champ. Instead, it felt like a flat and bland imitation. Considering that director Mann made the tale of a fat, middle-aged corporate whistle-blower compelling two years earlier with The Insider, you’d think he could do wonders with The Greatest. However, the movie suffers from scattershot storytelling, an excessive emphasis on style, and a surprisingly uncharismatic performance from its lead actor. Muhammad Ali’s life merits a great film. Ali fails to become that movie. 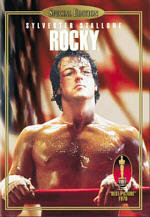 Note that this DVD includes the “Director’s Cut” of Ali. This extends the original theatrical version by about eight minutes. Don’t expect a lot from this material. The new version mostly adds some small tidbits to existing scenes. We see a little more of Ali’s father and some other minor moments, but I didn’t see anything significant. In other words, the impressions left by the theatrical cut don’t change with a viewing of the longer one. 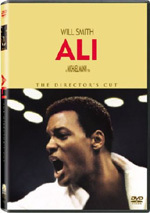 Ali appears in an aspect ratio of approximately 2.35:1 on this single-sided, dual-layered DVD; the image has been enhanced for 16X9 televisions. Overall, the picture looked solid, but a few concerns made it fall below “reference” levels. Sharpness generally appeared positive. Some wide shots displayed a mild amount of softness, but they were rare. Usually the movie seemed nicely defined and distinct. Jagged edges and moiré effects presented no issues, but I did see some moderate levels of edge enhancement. Print flaws were fairly nonexistent. I saw no signs of grit, speckles, nicks or defects of that sort, but I did notice some grain at times. That element never became overwhelming, but it seemed a little heavy on occasion. Note that a few scenes were shot in low light on a DV camera, so the artifacting visible resulted from the source material. Ali featured a subdued and stylized palette for the most part. Early scenes were cast in a cold blue, and segments in things went wrong often used a nauseating green. The DVD replicated these tones with good clarity and richness, and when the movie used realistic hues – usually during fights – they became quite vivid and vibrant. Black levels seemed deep and dense, while shadow detail was appropriately thick but not overly opaque. Ultimately, Ali provided a very good visual experience. Also positive was the film’s Dolby Digital 5.1 soundtrack. It didn’t provide an aggressive soundfield, but the imaging made sense for the film. The forward spectrum dominated the proceedings. For the most part, the movie displayed ambient effects, and the mix showed nice breadth and spread across those channels. The music offered solid stereo presence as well. The surrounds became active mainly during the fight sequences. A few other scenes – such as those at nightclubs – provided good use of the rear speakers, but the boxing matches became the liveliest, mainly through the use of crowd noise. Audio quality consistently appeared excellent. Speech sounded natural and distinct, with no signs of edginess or problems related to intelligibility. Effects were clean and accurate. They displayed fine clarity and good bass response. Music also seemed bright and vivid. Dynamic range appeared impressive, and low-end came across as quite tight and deep. Ali didn’t dazzle me with its soundtrack, but the material worked well for the movie. How does this disc compare with the theatrical cut released in 2002? The two looked and sounded virtually identical. All the same strengths and weaknesses occurred for both versions. Although Michael Mann apparently used to dislike extras, he contributes some elements to this new “Director’s Cut” version of Ali. The primary feature comes from an audio commentary with Mann, who offers a running, screen-specific discussion. Though he occasionally touches on filmmaking issues, Mann mostly talks about historical background. He provides notes about the era in which the movie takes place and its various characters, with a logical emphasis on Ali himself. Other moments talk about bits like locations, the use of digital video, and a few other production issues. However, historical topics heavily dominate. That fact becomes both a positive and a negative for the track. On the positive side, Mann seems passionate about the subject, and the information helps flesh out themes and concepts from the film well. Negatively, however, one can’t help but become frustrated at Mann’s refusal to discuss his craft. He’s a director, not a historian, and I’d really rather listen to him discuss his own work and not just general background about his subject and the era depicted. Given Mann’s prior reluctance to participate in many DVD extras, perhaps he agreed to the commentary only if he got to keep his filmmaking techniques a secret, but this means that the track seems less successful than I’d like. In addition, we get a documentary called The Making of Ali. In this 28-minute and 53-second program, we get movie snippets, behind the scenes elements, and interviews. 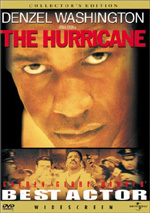 We hear from Mann, actors Will Smith, Giancarlo Esposito, Jeffrey Wright, Michael Michele, Ron Silver, Barry Shabaka Henley, Mario Van Peebles, Jon Voight, and Nona Gaye, boxing trainer Darrell Foster, technical consultant Angelo Dundee, actor/boxer Alfred Cole, boxing coach Michael Olajide, Jr., screenwriter Eric Roth, composer Lisa Gerrard, editor William Goldenberg, and production designer John Myhre. The various participants talk a lot but don’t say much. Mostly they let us know how hard they worked and how much they strove for perfection and authenticity. The footage from the set offers some nice insights, though they fly by quickly. In addition, the occasional tidbit of useful information about the shoot appears, as we learn about facts like an unusual camera system, the goals of the score, and boxing training, but not much of value pops up here. Even the richer moments come bogged down by hyperbole and praise, most of which talks about Mann’s greatness. It seems startling that a nearly half-hour documentary includes so little concrete information, but this one stays puffy and lackluster for almost its entire running time. I also remain surprised by the lackluster quality of Ali itself. The movie seems only sporadically engaging, as it appears superficial and lifeless much of the time. Some excellent performances from the supporting cast help make it more interesting, but a vague turn from its lead actor lets it down in the end. The DVD provides slightly flawed but generally solid picture quality as well as fine audio. We get a couple of extras that present some useful information but don’t come across as exceptional. When I look at recommendations, I need to get into a few different factors. For those who might consider Ali sight-unseen, I can’t push it too hard. It’s occasionally interesting but not something I’d advise for more than a rental. Already-established fans have a different question, especially those who already own the prior DVD. For them, I think they should probably stay with the original version. The reintegrated footage in the Director’s Cut doesn’t add much, and neither of the new supplements seem very engaging. I don’t think it’s worth the extra money a “double-dip” would require. However, fans who don’t own the old disc should definitely go for the Director’s Cut DVD. While I wasn’t wild about the additional footage worked into the movie or the supplements, they still add value to the package that doesn’t exist in the original release. Of the two, the Director’s Cut is clearly the superior release and the one for new fans to buy.